The Maryland Terrapins (17-5, 8-3 Big Ten) were able to defend home court against a then-unranked Wisconsin men’s basketball team (15-6, 7-3) Jan. 14. Currently sitting at No. 21 in the country, the Terrapins are the last team to have bested Ethan Happ and company. This Friday, No. 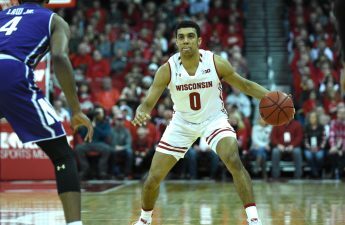 24 Wisconsin seeks to exact revenge back at the Kohl Center and extend a four-game winning streak that has vaulted them back into the AP Top 25. It’s an important game for both teams, with both Big Ten and NCAA Tournament implications. With a win, either team’s stock will rise, as another win against a ranked team would solidify their spot among college basketball’s best. With a loss, either team could fall out of relevancy, back into the oblivion of the unranked. When these teams met two weeks ago, the Badgers were fighting for their lives, having been booted out of the AP Top 25 and in dire need of a win. They were outscored 33–15 by the Terrapins in the first half before finally picking up the pace in the second. The Badgers came all the way back and eventually tied the game on a Nate Reuvers triple from the top of the key. Wisconsin then took a one-point lead with under a minute left on a Brad Davison corner three. But it wasn’t enough for UW, as Maryland was able to come out on top 64–60 behind 19 second-half points and a dagger three from junior guard Anthony Cowan. Speaking of Cowan, it’s likely that he’ll be the center of attention for Head Coach Greg Gard’s defense come Friday. The 6-foot, lighting quick guard is averaging a team-high 17 points and 4.5 assists per game in what, so far, looks to be an All-Big Ten worthy season. Cowan’s a matchup made in heaven for Davison, who has spent his tenure at UW disturbing opposing players who otherwise would have field days against the Badgers. Look for the two to go at it all night long, and become a key factor in who emerges from Thursday night victorious. Just like Wisconsin has Happ, Maryland has big-man Bruno Fernando. At 6-foot-10 and 245 pounds, Fernando is unlike most college basketball players in that he can hang physically with Wisconsin’s All-American. Fernando has been putting up huge numbers lately, with 22 points in a blowout win over Northwestern, and the sophomore has been touted as a potential first-round pick in the 2019 NBA Draft. 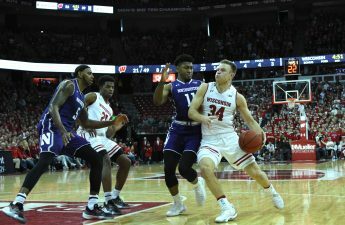 In the last matchup against UW, Fernando and Happ held each other to just 10 points each, as they baited one another into quick fouls that forced them to sit on the bench for extended periods of time. We know what Happ is capable of, and if he’s able to play well against Fernando, the Badgers could cruise to victory. But if Wisconsin can’t at least contain Fernando, Maryland can steal a win on the road. While the star matchups will steal the headlines, this game is also an important chance for the Badgers’ bench to make a statement. Maryland is full of strong athletes, so guys like Kobe King and Aleem Ford may be tasked to play big minutes if UW’s starters cannot contain the Terrapins. Another name to keep your eye on is Brevin Pritzl, who’s shooting off the bench has been valuable of late. 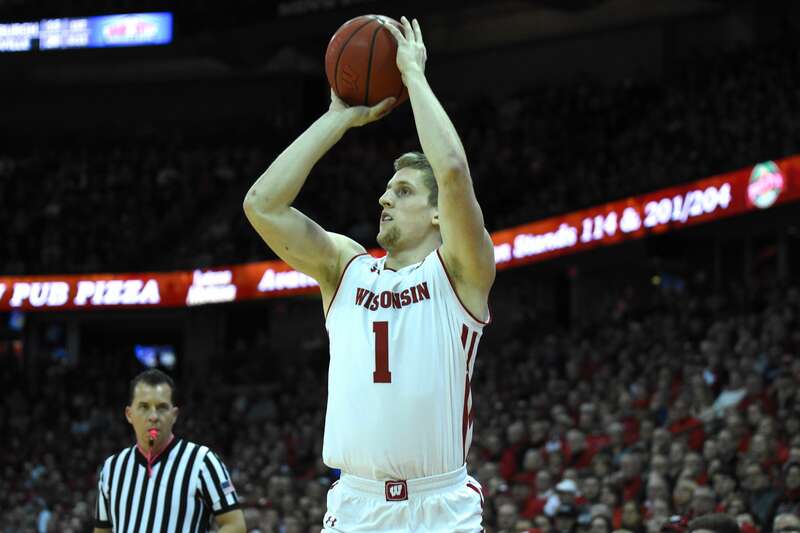 Pritzl hit two big threes for the Badgers in Tuesday’s 62–51 win over Nebraska. Wisconsin will be going against one of the best bench players in the country in Aaron Wiggins, a freshman who has averaged 8.7 points per while shooting over 41 percent from deep. Friday night will be a huge test for both Wisconsin and Maryland, so expect both teams to come ready to play a full 40 minutes of competitive basketball. The white-out game can be viewed on Fox Sports 1, the Fox Sports Go app or listened to live on the Badger Sports Network. Tip-off is set for 8 p.m.